In Hann. Münden, which is only 6 km. away from our inn, starts the Weserradwanderweg and only two kilometres away is another beautiful hiking trail through the romantic ”Werratal”. Our familiar inn is the starting point and goal for many extended-or short- bicycle tours since a variety of beautiful sights are only a few hours ride away. 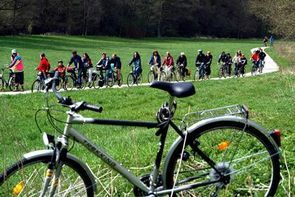 The General German Biker´s club (ADFC) qualified us as a particular ”biker-friendly guesthouse”. For instance we offer our guests to dry their laundry, repair their bikes and store them. 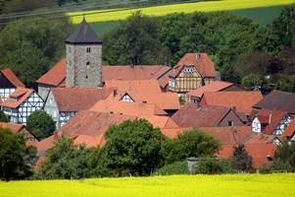 The picturesque village Lippoldshausen is easy to reach either by car or by bike. You can quickly reach a variety of the region´s beautiful sights. The ministery Bursfelde close to the river Weser in the 900-year-old Benedict monastery. The old university town Göttingen, with a great number of museums, theatres and many opportunities for leisure and recreation. 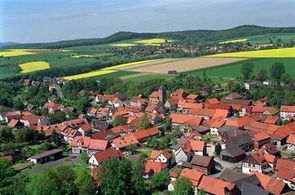 Witzenhausen, the town of cherrys, in the Werra-valley. The ferry boat on the river Weser in the beautiful village Hemeln, a popular get-together for motorcyclists and bikers. Historic churches in the gorgeous region around Münden. The leisure park with zoo and automobile museum in Ziegenhagen.